Well, I already moved on to the Puzzle World stuff, but there was one final thing left to do for Tai Ming's second zone (aside from any fixes and/or additions we might add later on): the Giant Thorn-Worm boss portrait! Based on Fred's sprite to the right, the Giant Thorn-Worm boss portrait is pretty straight forward, as it's.. well, just a worm. 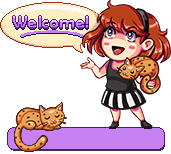 Of course, it had to be adjusted in some ways: for one, it needed to be a lot longer than it is in the sprite, or it'd barely reach above the title text! I also added a few more spikes to its back. Other than that, I tried to stay true to the sprite. Perhaps I could have added some texture to its skin, and maybe I will at a later stage - but I think it's important that the boss portrait resembles the actual sprite as much as possible, especially when the sprite is as big as the Giant Thorn-Worm is. To the left is the process GIF: again, very straight forward stuff, going from line art (made with the sprite next to it for reference), to color blocking, to shadowing. The highlights are very limited on this portrait - something that could get changed at a later stage as well, depending on whether we want the portrait to feature a more slimy worm than it appears in the game. 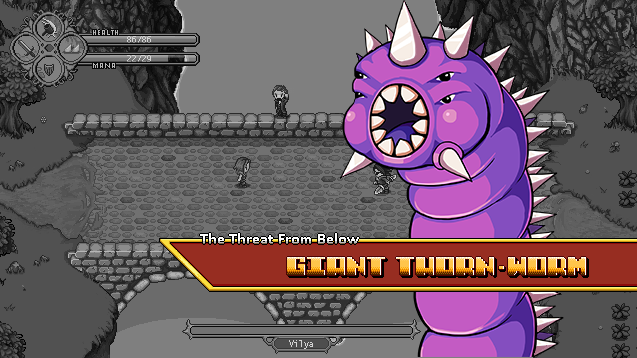 As for the boss title, the main title will be "Giant Thorn-Worm", with "The Threat from Below" as its sub-title. This is actually a reference to the movie Tremors, which was known as "Hotet från Underjorden" (The Threat From Below/the Underground) when it came to Sweden!